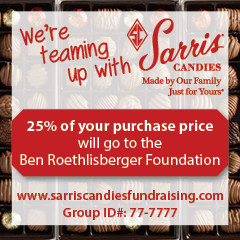 it’s Steeler Nation with a post FOR Ben. So stick to the fight when you’re hardest hit, it’s when things seem worse that you mustn’t quit. @_BigBen7 that poem is deep! Jean Trail You did your best. We love you…thank you. Feel bad today and then be done with that. On to next year!! Misty Clark Ben you are a good player. You do put your hear and soul into every game. Somethimes it just don’t turn out . It helps to have all our players playing healthy. You do your best. You came far.. Love you STEELERS. You will always be my team. 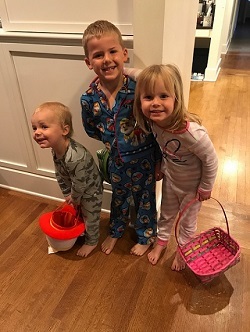 “Ben, You are a true leader, you fight till the end no matter how tough things get, you never quit on this team or on the fans and we are so blessed to have you as are our QB… Take this time to enjoy your beautiful family, there is always next season and we will always be cheering you on.” — Billie Jo & Greg Yakubik (photo above with friends Mike & Jamie Harmon). 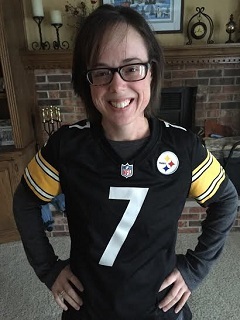 Kathy Mae WE win some and WE lose some but at the end of it all WE (true Steeler) fans love you and appreciate you as the great QB you are!! The lost was not only shocking but sad but no apologizing needed from our awesome QB! 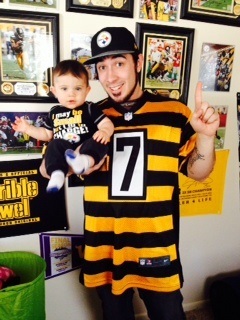 We love you Ben and love our steelers win or lose!! Take some time and enjoy your family! @_BigBen7 Ben you are a class act and can’t be perfect every week. 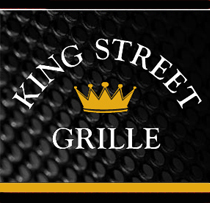 SteelerNation has your back and next step in journey in the fall. Steven Fair We love you Big Ben .Get some much-needed rest and family time see you next year. Thanks for an exciting season. Pam Deli What team has “6” Superbowl” trophies? It was just a tough game to watch especially, who we played. Live & Learn! Besides what you do on the field, I want to say “Thank You” for what you do off the field. When my sister had Cancer you sent her an autographed picture, and I want to say TY for that, she has since passed, but it made her day to receive it. Our family was soo appreciative! “I’ve been a loyal fan of yours since day 1 and appreciate all of your hard work and sacrifices that you make for your fans. Thank you for a great season this year and can’t wait until next year!! !” — Taylor Moore (photo at left with sister, Stephanie, and dog, Mini). 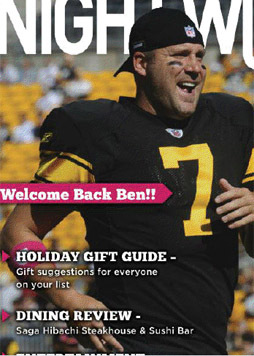 @_BigBen7 Amazing season Ben! Thank-you for all that you bring to our city, our team and our hearts. Tough loss – not on you – team loss. @_BigBen7 Thank you for a record breaking season. I would want no other QB in the league on my team. #SteelerNation loves you! Carol Hackett Classy act Ben! Must be awful to have to answer questions after that important a loss. It is a team effort and it just didn’t happen tonight. Thanks for all you did to get us to the playoffs. I will always cheer for you and the Steeler! Work hard in the off season and enjoy your family. @_BigBen7 You’re a true warrior in every sense. Spend some quality time with your family. See you in Latrobe. “Congrats to Ben on a great season. Can’t wait to teach my boy about the draft and gonna bring him to the draft party at Heinz. 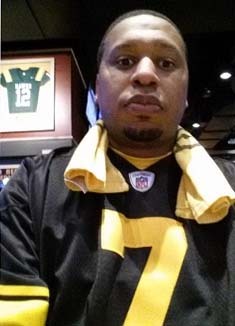 GoSteelers!” — Bob Tschappat, Jr.
@_BigBen7 Get’m next year sir. Thank you for being our quarterback. Ann Trombetta You had a great season. Hold your head up high. This was a team effort and everyone did their best. I know it’s a long way to next season but it will be a good one. 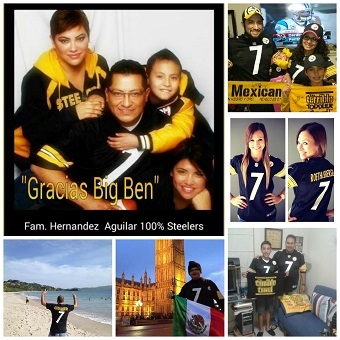 Thanks @_BigBen7 for an awesome season & 1 of the best moments of my life week 9. Still wearing your jersey today. 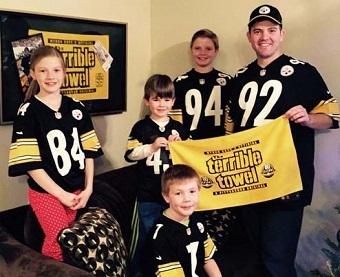 @_BigBen7 no need to apologize, this team was were it was because of you. We’ll get it next year. Need you to be a STEELER 4 LIFE. @_BigBen7 I hope you comeback Stronger and Better than ever next year and thank you for being the Man of God and Player/Steeler u are!!!! Scott Rohde We are blessed to have you as our quarterback. We did win the AFC North. You had a great year Ben. Thank you for playing with all your heart. Thank you for what you bring to the Pittsburgh Steelers. There is no need to apologize. It was a great season. We will get it next year. Take care of yourself Ben!!!! Brenda Hoffman Braden I love you Big Ben, no ifs, ands, or buts, you are the best in my eyes!!!! Rosie Barraza Rivera We love you Ben, you did what you could and brought some great games to us, lets do this next year with the Triple Bs!!! But proud of all our guys!!! GO STEELERS!!! Thanks to Polamalu for getting in there and putting some effort in trying to help us win as well, nothing but love to our TEAM!!! RuthandDavid Potts Ben you don”t need to, you played a great game and all the Steelers played with a lot of heart, I’m proud to call myself a Steeler Fan!!! Jill Floyd Brogan WE LOVE YA, BEN! Please don’t blame yourself. We win as a Nation and we lose as a Nation! WE Love You, BEN! “Hi Ben, I am Noah and I love the Steelers. 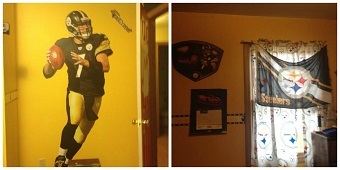 I’m 11-years old and my Steelers room has black and yellow walls and posters of you even a fat head of you because you are the best. You taught me to never to give up. — Thank you, Noah Cowgill (photo of his room at left). David Burkhardt Ben, no apologies! Think about when y’all were 7-5 and were almost not in the playoff picture! Ripped off 3 more wins and got into the playoffs! So many injuries this year, there were questions and uncertainties from week 1 about the Steelers’ season prospects! You and the rest of the Steelers shut everybody up. The refs gave this game to the Ravens. Could you and the while team have played better? Sure, but I believe y’all left it all out on the field last night! 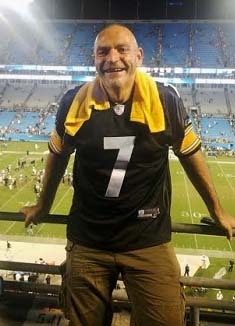 Win, lose or tie, I’m a Steelers fan til I die! It would have been nicer if Keisel had been healthy this year, but overall, this season was successful, all things considered! Shane Lee Ben, we’re lucky to have your accountable style of leadership. Men like you are in short supply these days. You did your best. We are proud of you and the entire Steeler organization! Thanks for a great season! Sandra Osche Ben, thank you for an exciting year! Helping to lead the team back when so many doubted. It is a team sport, don’t put the blame on you alone. See you next year! Joseph Annarelli I will always be a Steelers fan, this team gave us fans a lot to be proud of this year. See ya in August. 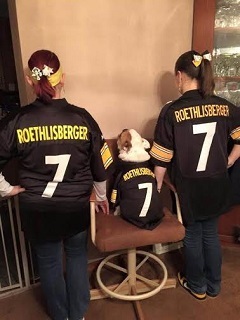 @_BigBen7 you are still the only QB I would every want leading our team ! You are a true leader and winner on and off the field! @_BigBen7 no doubt in my eyes and SteelerNation you are the best damn QB in the league. Charlie Brown Listen Ben..you have bled for us..played with broken bones..led us to two super bowls..you are a true steeler!!!! For ten years you been one the best in the game..true steelers fans love you!!! 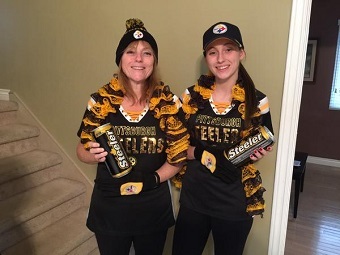 Thank you for all you done for us..for a lot of us the steelers are more than a football team..your our lives all year around..we love you and our steelers!!! I have since I was four years old and forever!!!!!!! Adriana Ochoa EnriquezYour best 2nd fans of mexico r wirh u.bad day and circumstances but u r the best 4ver,hugs,i believe u will bring the title soon. @_BigBen7 You don’t have to apologize to anybody.You made me spend exciting season. Best regard from Japan. Cameron Sibbald Last year we went 8-8, this year 11-5 and playoffs, we have had a great year, 1 very happy supporter from Australia, thank you. You never have to apologize for what you do for the team and the City. It was great watching the team and you have a great season #1QB #1guy! But always look forward to spending time @Nemacolin. Couldn’t b nicer to an avg guy like me! No one deserves a SB more than Ben! Maretta Campbell No need to apologize.. We’re proud of you for brought this far, “Hugs” “Thank You ” we have 6 Super Bowl Rings .. hmm.. Can’t name any NFL team that does ? 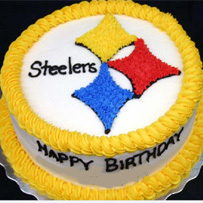 I’m a Die hard Pittsburgh Steelers fan, Nobody will ever change that ! A SEASON BEHIND US WE MOVE FORWARD A STEELER NATION UNITED AS ONE ! I’m proud to be a Pittsburgh Steelers Fan ! @_BigBen7 The selfless qualities of a great leader, but no one could sees anything but what you are: an all time great Steeler. 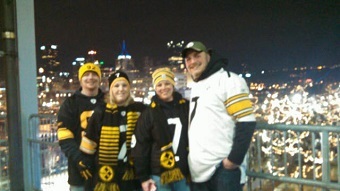 @_BigBen7 you played the best you could. You always give us a chance to win. We will be back next year better than this year. Megan Stringfellow Dude you’re awesome!!! You can’t do it all all the time!!!! Our family still loves you!!!!!!! Thank you to everyone who took the time to send/post/tweet these messages! !